(Newser) – Katie Ledecky is competing only with herself, it seems, and Michael Phelps has to clear out more space in his medal case. Phelps, the most decorated athlete in Olympic history, added to his staggering haul Sunday night in the 4x100-meter freestyle relay, giving the US a lead it never relinquished, the AP reports. 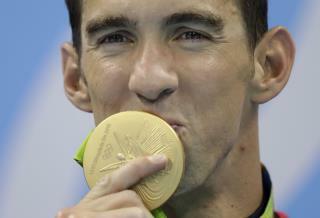 Afterward, he collected his 19th gold medal. 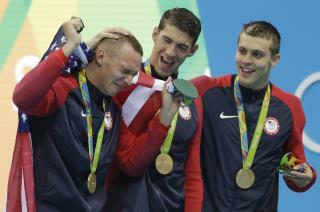 "When I was on the block, I honestly thought my heart was going to explode out of my chest," Phelps said. "I was so hyped tonight and so excited." 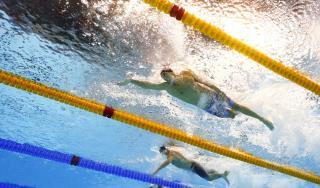 It was quite a night for the Americans, who were shut out on the golds on the opening night of swimming. Racing nothing but the clock, Ledecky gave the US its first victory by crushing her own world record in the 400 freestyle. She beat her nearest competitor by nearly 5 seconds. "In all, six world records have fallen on the first two days of swimming." Wow! The water must be extra wet down there! what drug were they on?? Ain't nobody gonna touch Katie!